To Mr. Michael Moore…..what would Jesus do? First off, Michael Moore, do you know what Jesus would do? Do you? Because I do. I know him quite well. So before you go hypothesizing what Jesus would do, you best check yourself! I know Jesus got pretty pissed off when he went into a temple and saw all sorts of crap being sold there! He wasn’t happy about it, because it was to be a house of prayer. Yep, he got so angry he started flipping over tables and benches! He saw injustice and HE DID SOMETHING ABOUT IT! 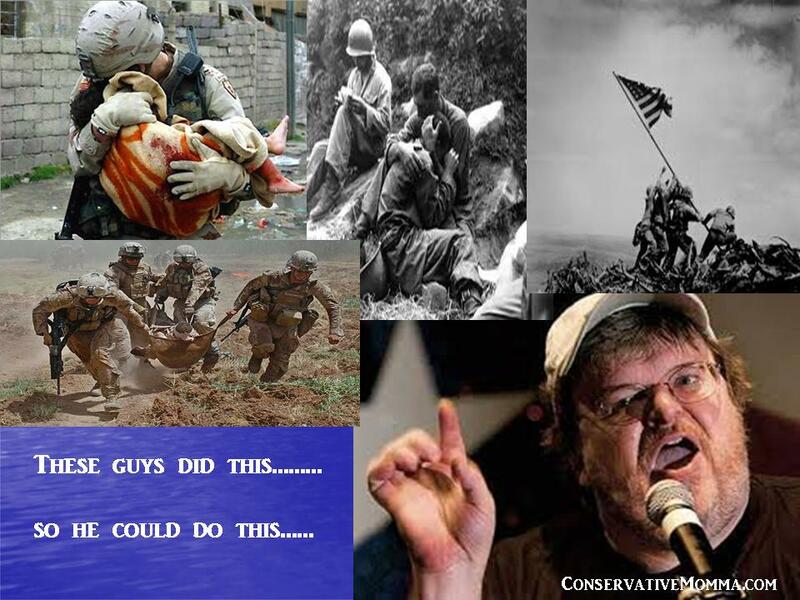 So Mr. Michael Moore, to answer your question, “what would Jesus do”……well, I think if he saw innocent women and children being buried alive (because that’s what is happening over there) -he’d DO just what what Chris Kyle did! Hey…..I get this is America and you have every right to spout your “little” (not really “little,” more like gigantor) mouth off, but just remember WHO provided you that right! Now as far as Jesus and you are concerned….that Mr. Moore is solely up to you…. The greatest gift, has already been given! With Christmas just days away, I want to break from the politics and take a moment to give recognition to the true meaning of Christmas. “The reason for the season,” we hear it so often said….understanding it, is a whole other story. Can you imagine loving something so much you’d sacrifice your child for it? The very idea blows my mind! Why? How? What would cause someone to do this? I’d do anything to protect my children…anything! So to have the idea of God, loving humanity so much, he gave his only son (knowing that years later-his son would lay down his life for all mankind) sounds crazy! Mankind at its core, is not perfect. If you disagree, just turn on the news for a few minutes and you will hear of unspeakable horrors that mankind is capable of. Also witnessing your absolutely adorable toddler throw a tantrum of outright defiance, shows that wrongdoing is innate. To start, let me preface by saying I believe that mankind was created. It was not by accident, but by choice. This world was given to mankind. It was a gift. Now many gifts will be given this Christmas season. When you give a gift, it’s done. You don’t ask for it back. The receiver now has control over what happens to that gift. That gift no longer belongs to the giver. This world is a fallen world. It is a world that years and years ago was given CHOICE and mankind chose to NOT take from the tree of life, that God offered but instead the tree of knowledge of good and evil. God would not force himself on us, he gave us free will. If you are forced to love something, and to engage with something with no choice -than the relationship is invalid. God wanted a relationship, but he wanted it to be freely engaged in. We chose to NOT choose him. In doing this, mankind separated itself from its creator. It was here; the door to evil and sin were opened and given free reign here on this earth. For years mankind tried to connect with God, and God tried to connect with his creation. But it is our sin that separates us from God. God is all good and cannot be in the presence of evil, and no evil can be in the presence of God. Priests and Rabbi’s, were even imperfect and would have to wave incense to cloud temples before entering to shield them from the presence of God because it was too intense….and that cloud created a barrier of protection from God. Perfect love casts out all fear/evil. God is perfect love, and in him there is no evil. Mankind continued to fall short, and God desperately wanted to connect with His creation. The only way God would be able to reconnect with his creation, would be to have someone pay the ultimate penalty for humanities sin, because God cannot be in the company of sin. It was over two-thousand years ago that God, sent his son Jesus to earth. Jesus paid the price for all of our sins. He took every sin, sickness, disease, most unimaginable faults of humanity on that cross and paid the penalty for all of us. Many cannot accept what Jesus did. Why…..well…because they cannot accept the fact that they are not perfect, that they have fallen short. But it is in that recognition we find salvation, grace and eternal life in Christ. It doesn’t stop there. When you study the life of Jesus, he walked in power, and that same power was given to us. We are not victims but instead victorious through him. Jesus, laid hands on the sick and they recovered, he set people free of oppression, depression, fear, pain, hate and so forth and he told us to go and do the same. Jesus is the example of God’s original desire for all of us when he created mankind. During Christmas time, we see this beautiful little baby laying in a manger, but that baby was about to change the world forever. When Jesus received the Holy Spirit, when being baptized by John the Baptist-that’s when the POWER hit, and that same power is available to you and me. There is no greater gift than that! Though this world has removed itself from God, God now moves through those who accept him, because of Jesus’s sacrafice. The gift of Jesus is so much more than salvation; it unleashes God’s perfect desire for you here on this earth! So, when gifts are given in the next few days….remember the most spectacular life changing gift has already been given and it is freely available to you….you just have to accept it.